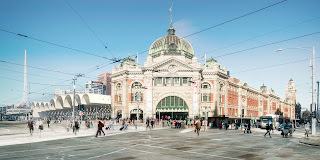 Flinders Street Station is located in the centre of Melbourne, sandwiched between the linear edge of the Central Business District (CBD) and the embankment of the Yarra River. 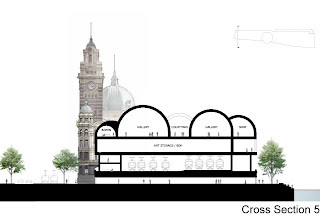 The linear form of the existing Flinders Street Station Building was determined by the original layout of the tracks. 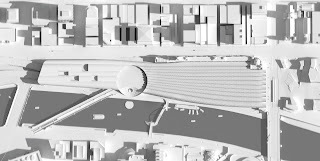 The building separates the city from the railway and from the river. 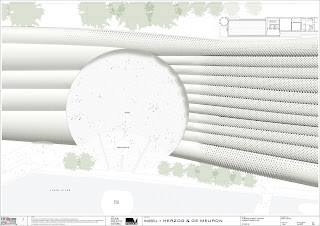 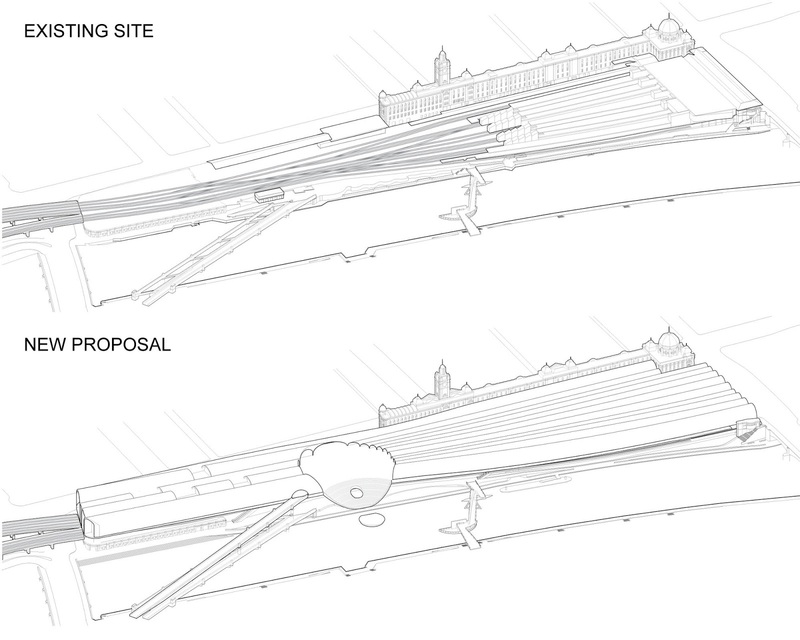 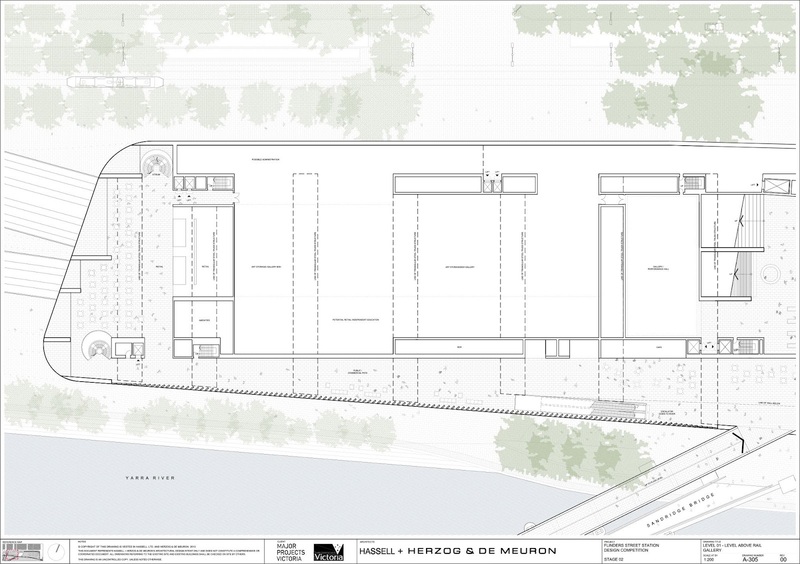 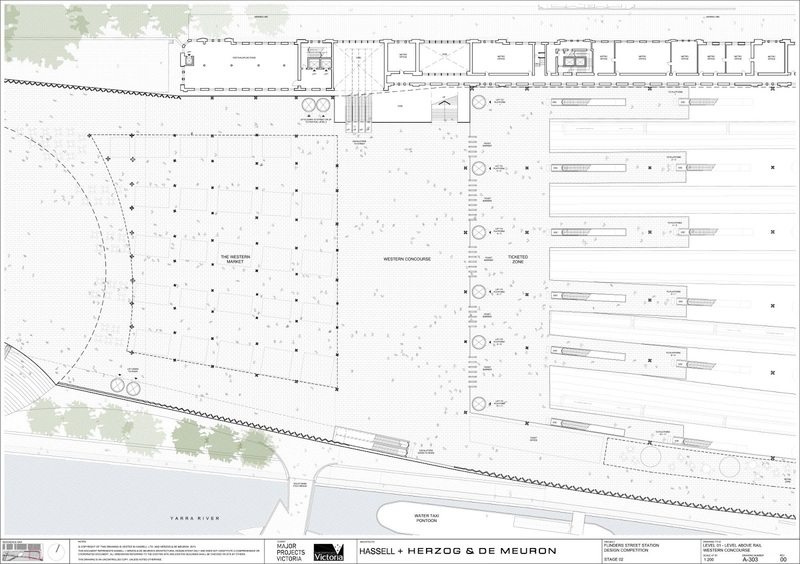 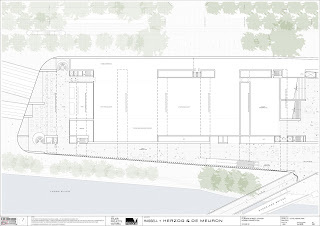 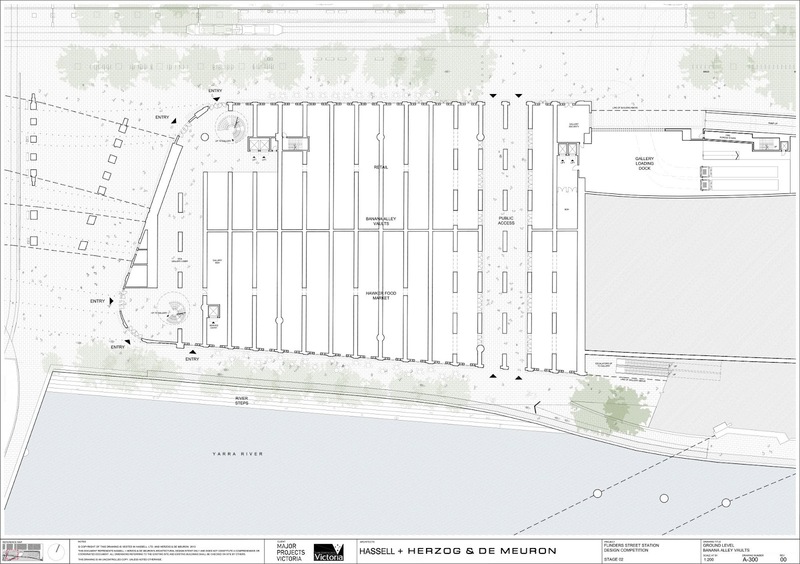 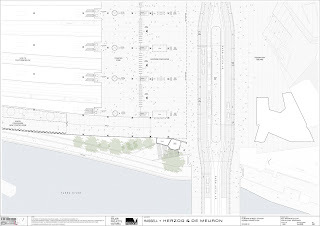 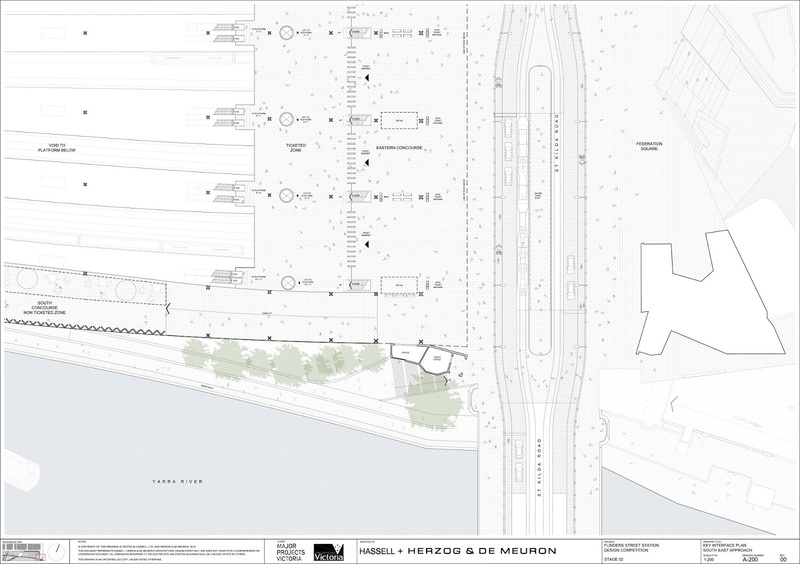 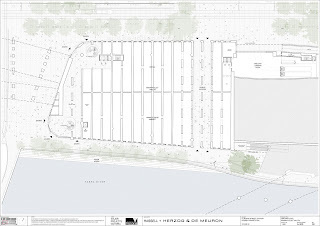 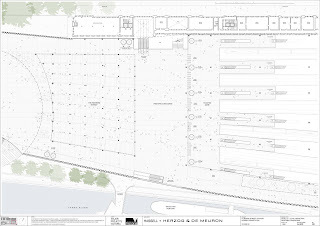 Our proposal respects this very specific linear nature and use of the site as a strong marker and element between the city grid and the river, but provides an urban response in this key location through public access and use of the entire site, affording various connections across the site and diverse public functions. An important part of the original design for the Flinders Street Station from 1899 was a generous arched roof, adjacent to today’s existing heritage building, with 3 large vaults. 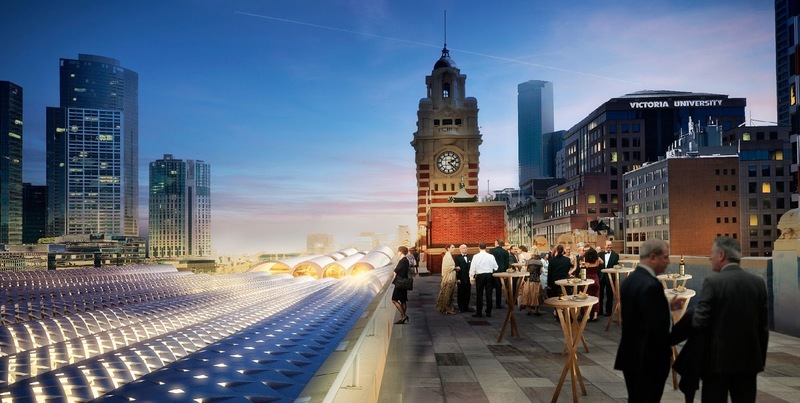 This roof was never realized, and therefore, the station’s intended glory has never fully materialised. 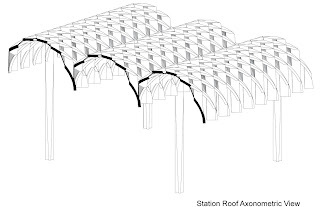 By tracing the arches and vaults in shape and scale from the existing heritage building, we define the main ingredient for the architectural expression of the new roof. Rather than creating one monumental gesture, we put the scale and proportion of the individual vault in direct relation with each passenger’s journey. 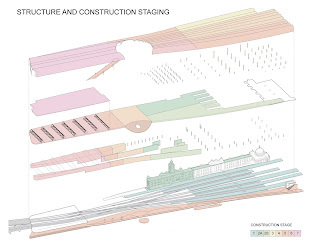 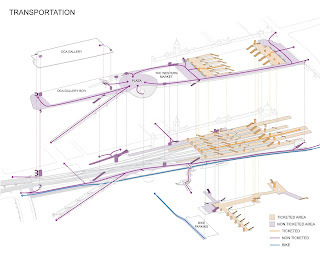 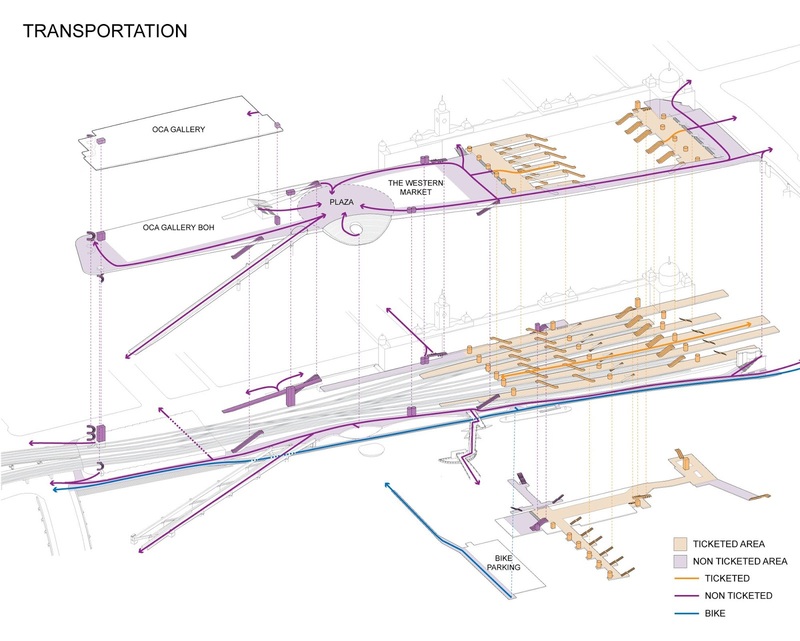 Each vault precisely defines the space above each train and the passengers on the platform. 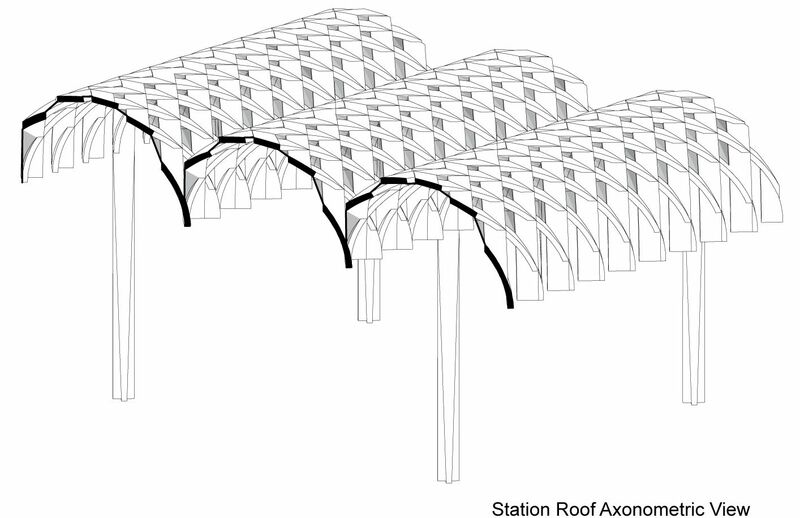 Each vault is extruded along one track line; thus, the roof is a direct projection of the linear track field into the third dimension. 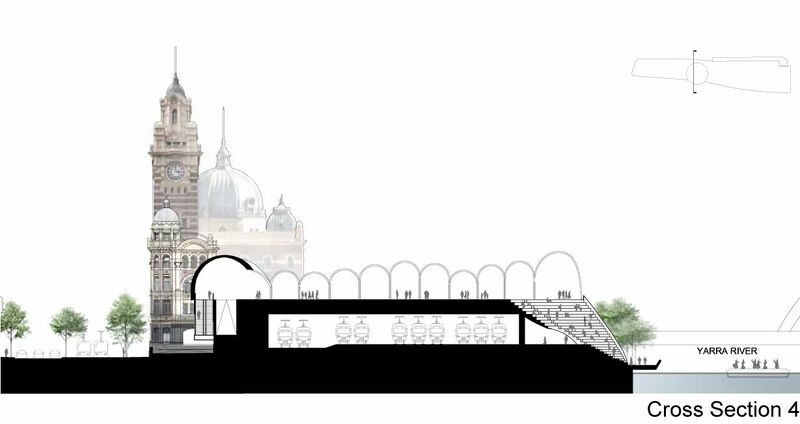 The result is one generous, yet horizontal roof scape made up of individual smaller vaults introducing scale and individuality. 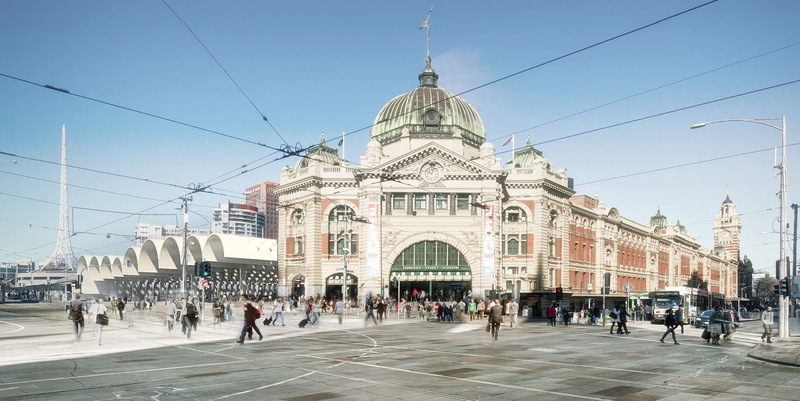 Like a passe-partout, it frames the existing Flinders Street Station building - underlining and at the same time completing its iconic quality. 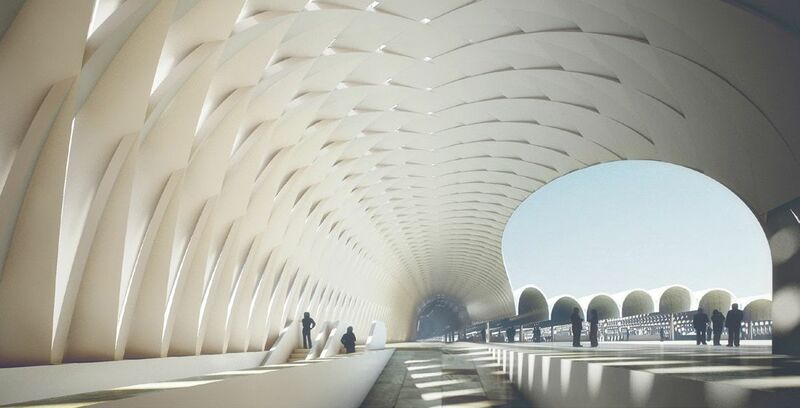 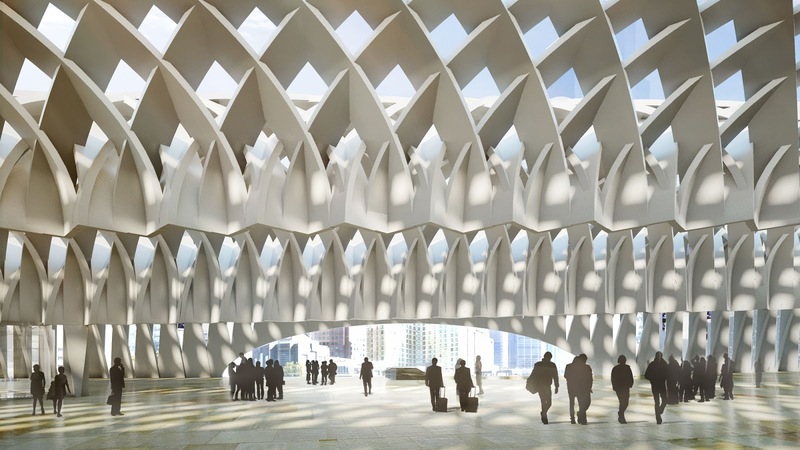 The actual construction of the roof is a reinvention of the historic vaulted roofs of classic train stations. 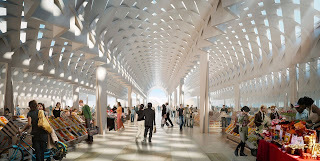 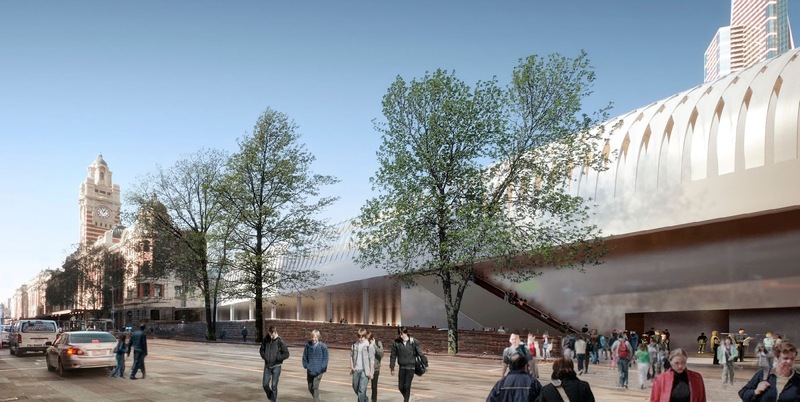 Woven structural bands create an articulated filigree roof that provides a weather protected environment, dispersing dappled natural light and ambience throughout the entire station. 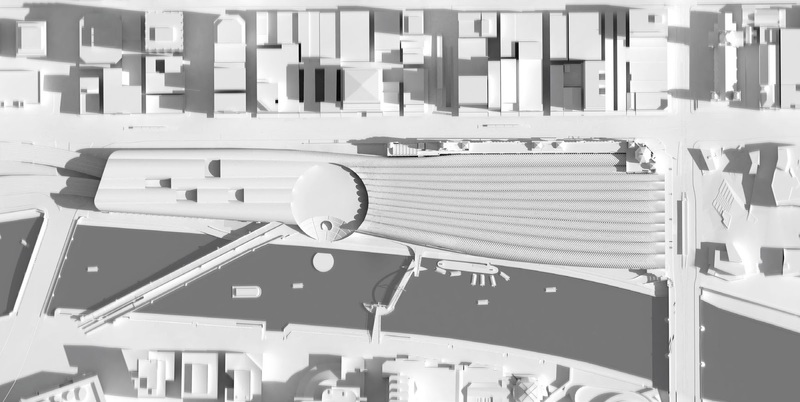 To underscore the civic nature of the station, we propose to add cultural and other public program activities to the remainder of the site. 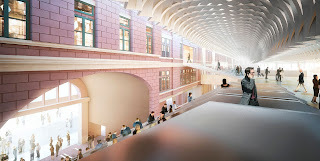 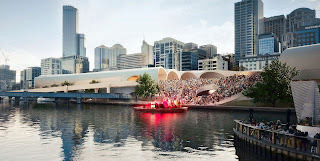 By placing a gallery for Oceanic and Contemporary Art (OCA) above the Banana Alley Vaults at the western end of the station, we acknowledge the Freshwater Place and the Falls area that existed there before the station was built, and were significant to indigenous people and an important factor for the siting of the city. 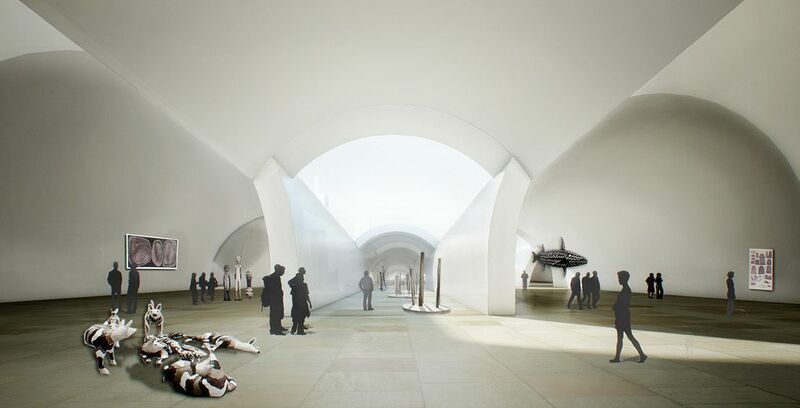 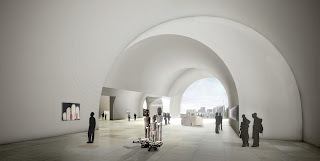 We extend the roof over the entire project perimeter; the station vaults become the gallery vaults. 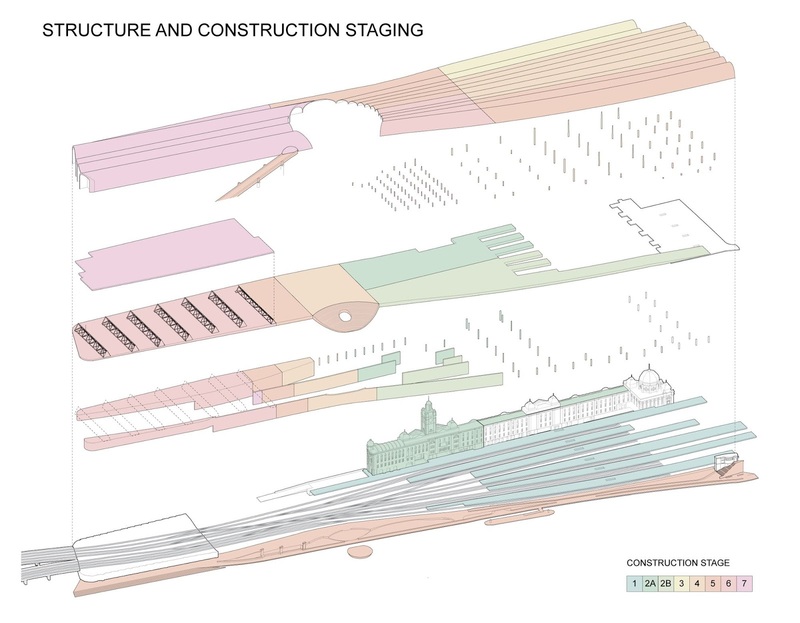 Scale and proportion change, but the concept of the vault extrusion following the track lines remains. 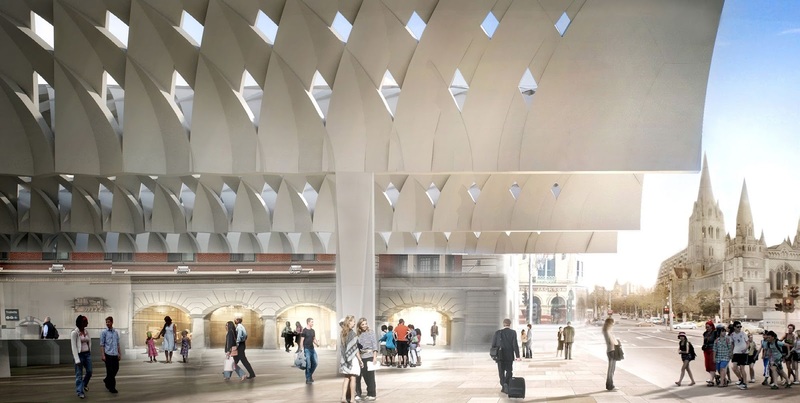 Both end facades, station and gallery, each have a distinct and characteristic identity, yet they share the unifying vaulted expression. 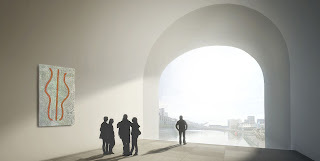 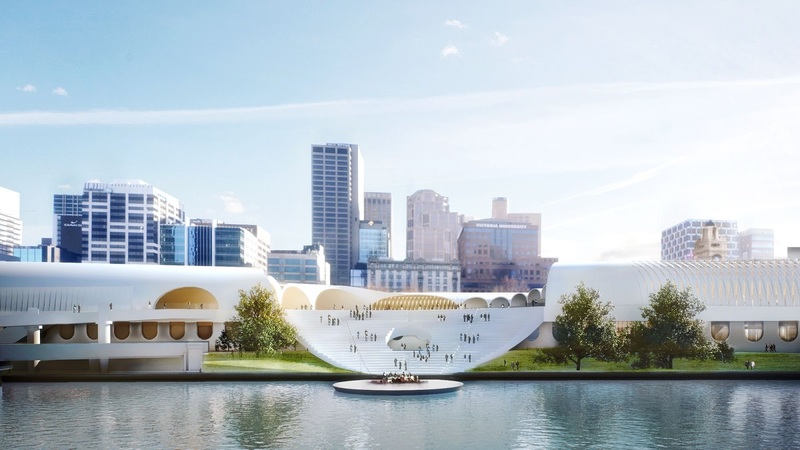 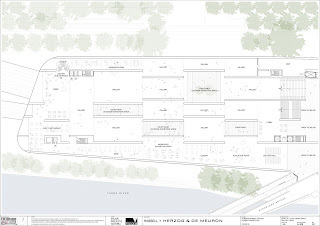 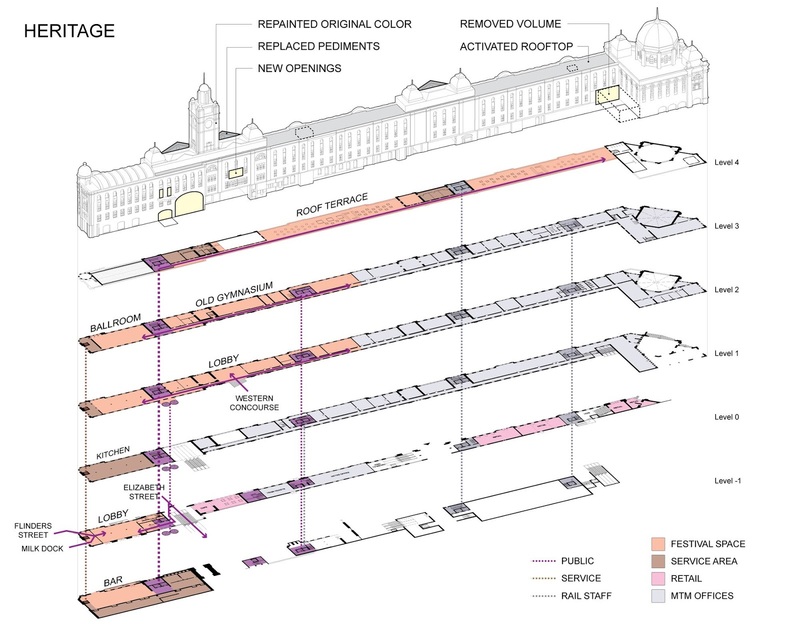 The concept for the galleries is simple with a regular pattern of intersecting vaulted spaces, resulting in calm and well-proportioned gallery spaces and courtyards allowing for diverse curatorial concepts, flows of circulation, and lines of sight. Education facilities, event spaces, workshops, a library, a small theatre, and a lecture hall provide a rich opportunity for programmatic and educational events. 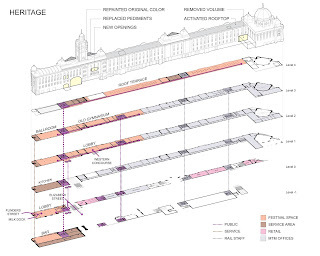 These spaces are located adjacent to and are directly accessible from the large circular plaza that is cut into the centre of the roof scape. 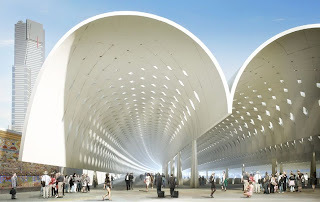 On the other side of this round plaza, the extended vaulted roof of the station concourse creates a large covered market area. 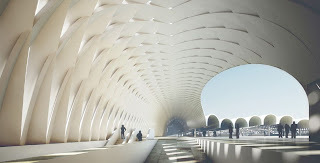 The round plaza becomes literally the hinge of the entire building and precinct providing a completely new and contained civic environment to converge on and for use in many different ways such as festivals, weekly speciality markets, or other public activities. 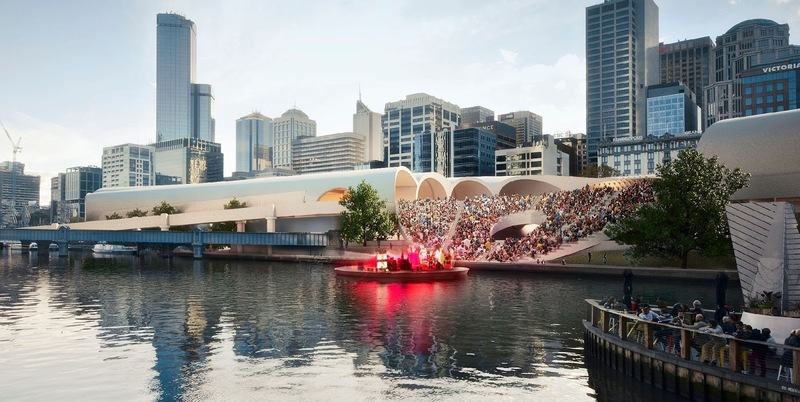 On the south side, it opens up to the Yarra River and a bowl like stair with steps for seating is folding down all the way to the river embankment. 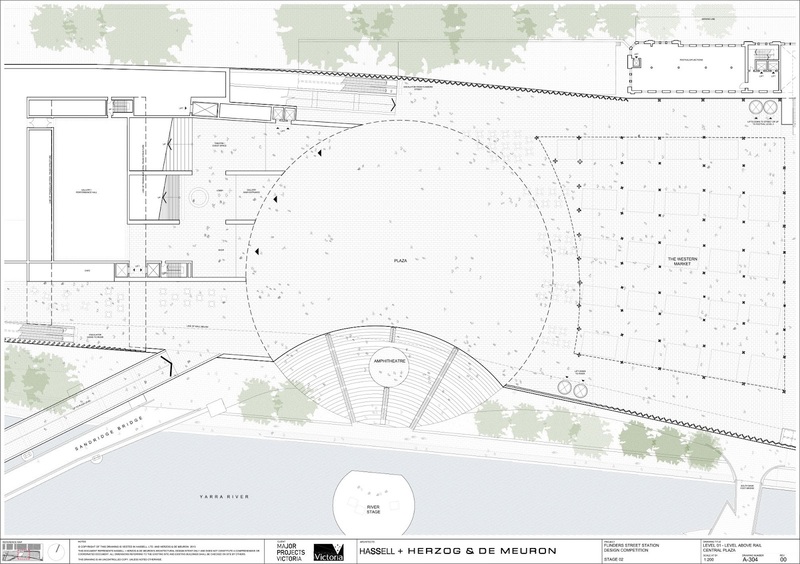 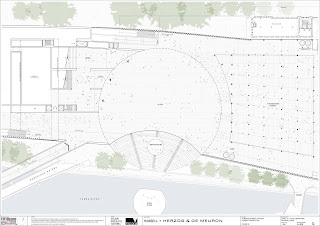 Together with a floating stage in the river, this amphitheatre can be used for performances of any kind activating the otherwise underused and somewhat unpopular north bank of the river. 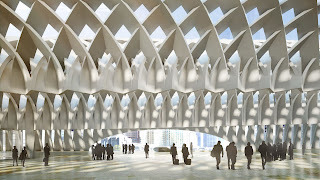 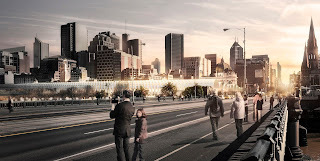 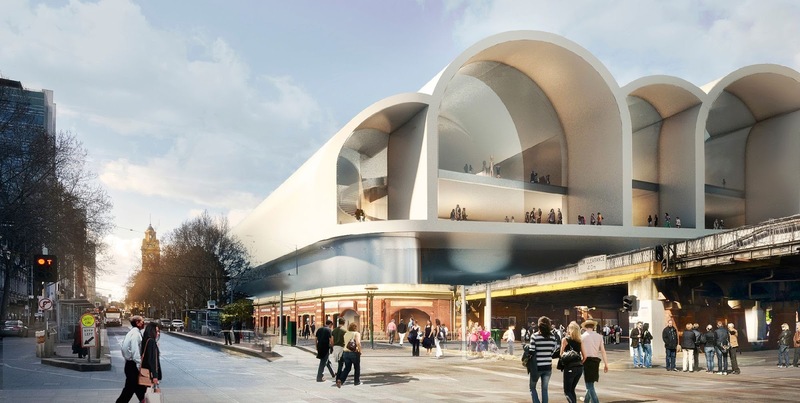 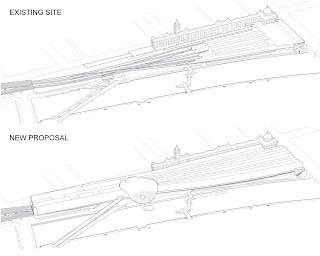 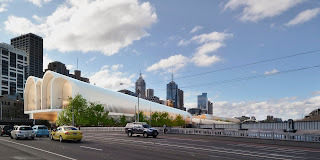 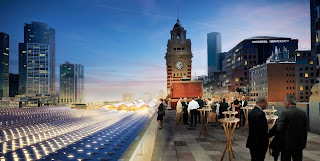 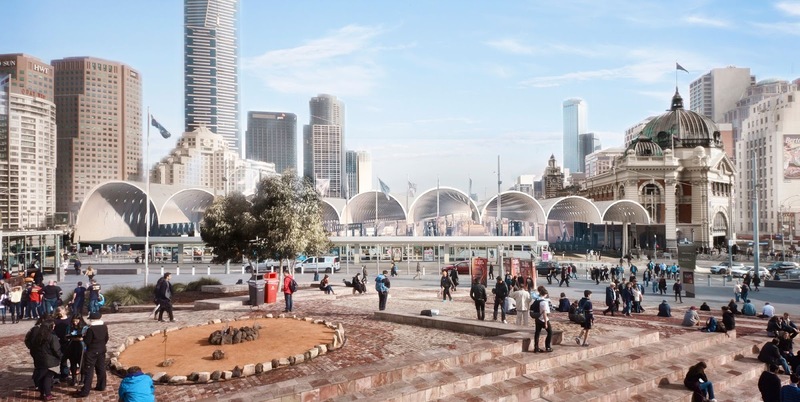 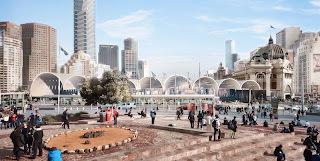 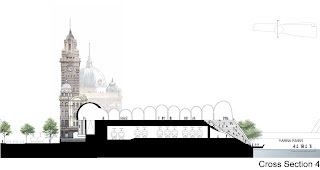 The new Flinders Street Station will be a truly unique and fundamentally public place: a civic destination with a distinct architectural identity catering to multiple public activities, offering a holistic experience on many levels and times of the day and forming an urban linchpin in the heart of the city of Melbourne. 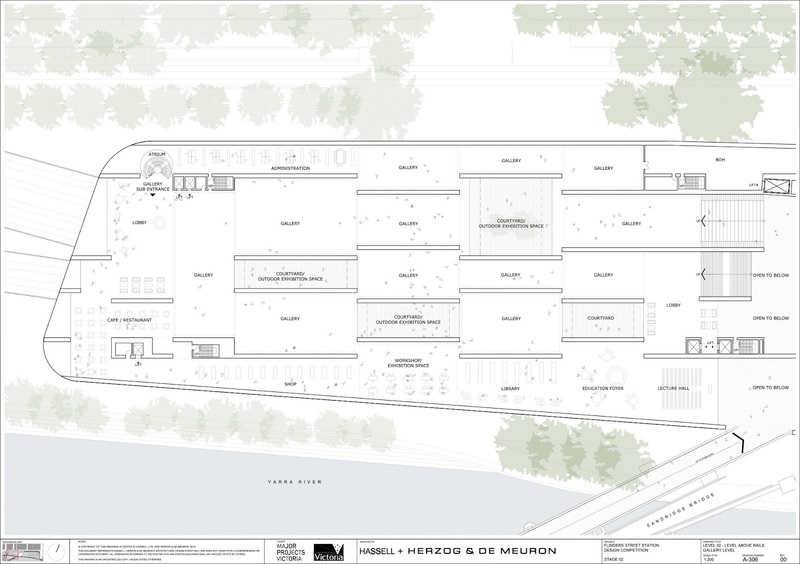 It's formal similarities to Kerez's Museum of Contemporary Art in Warsaw or Oscar Niemeyer's church in Pampulha are perhaps besides the point?